Since some pollinator species are in decline it is important to conserve these beneficial insects. Therefore, I will be discussing various pollinators throughout the season. The solitary bees to discuss this week are mason bees which are in the family Megachilidae since mason bees began to emerge from nesting habitat at my house just over a week ago (Columbia, MD on March 16th). In general, mason bees are early spring pollinators but a few species emerge in late spring or early summer. Mason bees nest in hollow stems of plants, reeds or galleries in wood left behind by wood boring insects. Mason bees get their name because of their habit of making compartments in their galleries that are separated by mud. 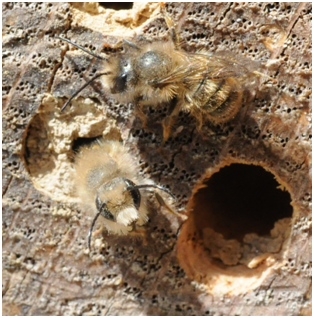 Above: Male mason bees just emerging from galleries in wood where they overwintered (photo by P. Shrewsbury, UMD). Mason bees are well known for the pollination benefits they provide and are some of the earliest pollinators of the season. It is estimated that just 250-300 mason bees can pollinate an acre of apples or cherries. Mason bee males emerge first and females emerge a few days later. This phenomenon, called protandry, is relatively common in the world of insects. It seems that female mason bees are a highly sought after “commodity” and males that emerge early in a season are more likely to find and hook up with mates. Once a male and female mate, the male bee then hangs out on the female’s back and fights off other males that would also like to mate with his partner. This “guarding behavior” ensures sperm from the original male are used by the female. Mated female mason bees spend many hours and days gathering pollen and nectar from which they create pollen cakes or balls. They fill hollow plant stems or wooden galleries with these pollen cakes. After collecting pollen from plants, the female returns to her nest and enters the nest tube head first, deposits the pollen cake (this may take several trips to get enough pollen for one cake), exits the tube, turns around and enters the tube abdomen first. She then oviposits (lays) an egg onto the pollen cake. She then seals that section of the tube or gallery with mud. The female repeats this process until the tube contains several pollen cake – egg compartments and is filled. She plugs the entrance with mud and may then search out another nesting site. Eggs that are destined to be females are laid in the back of the tube, and male eggs toward the front. Mason bees are active about 4 weeks and the females will fill as many nests (tubes) as she can in that time. The eggs hatch into bee larvae that consume the cake as they develop and grow during summer and fall. They complete their development (pupa and adults) during fall, settle down for winter, and are ready to emerge just in time for the return of spring. Mason bees do not produce honey, are not aggressive and do not sting. I stand for long periods of time in the midst of the 100’s of bees busy around their nesting site in my yard and have yet to be harmed but am always entertained by these beauties. Mason bees provide valuable ecosystem services by pollinating a variety of native and non-native flowering plants, many of which are fruits that we consume or flowers of plants in natural and managed landscapes that provide resources and habitat for animals at other trophic levels. For those of you who would like to become active in the conservation of mason bees you have a little bit of time still – but hurry! 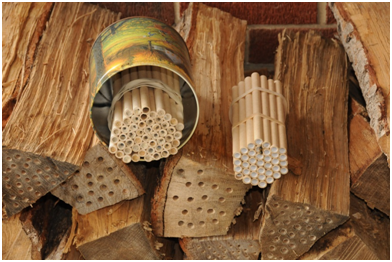 At my house I have purchased commercially available “bee tubes” and drilled holes into firewood (see the images). Not only can you enhance ecosystem services of pollination, but you create a great learning environment for children and adults. I highly suggest you try buying or making habitat for these beneficial, educational and very entertaining insects. There are many resources on line that can inform you of best practices for creating habitat and raising these beneficial insects. Do a web search for mason bees or bee tubes. NOW is the time to set up nesting sites!